Portadown-born Luke McCullough has gained another boost in his EURO 2016 summer dream with selection for March warm-up fixtures. 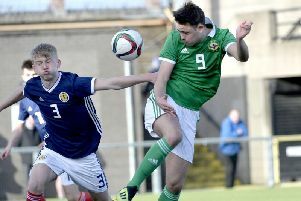 The Doncaster Rovers defender was named in the international panel for Northern Ireland tests against Wales and Slovenia towards the end of the month. McCullough has 27 club appearances with Rovers to his name this season and is aiming for a seat on the plane to France when Northern Ireland tackle the European Championships. Northern Ireland will face Wales in Cardiff on Thursday, March 24 before playing host to Slovenia at Windsor Park on Monday, March 28. Portadown-born Northern Ireland manager Michael O’Neill this week agreed a four-year deal with the Irish Football Association that will run until June 2020. “I am extremely proud to be manager of Northern Ireland and I have thoroughly enjoyed the role over the past four years,” said O’Neill. “I am therefore pleased to have signed this new long-term contract with the stability that it brings to me, the staff and the players.